The Preaching of God's word drives and shapes us. For this reason, it forms the major focal point of our weekly Sunday services. We think of our services as big family gatherings, so they are laid back, informal, and child friendly. We love having visitors of all ages and strive to create an environment that is welcoming to all. Our services start at 9:30am. We spend some time singing and praying together. We then have a short tea and coffee break while children move to age appropriate groups, Summerleas Kids and Crèche, for the teaching time. A passage from the Bible is then read and our pastor helps us engage with the passage through a sermon. After this, we sing again, before sharing morning tea together. This is a great opportunity to build community and make new friends. 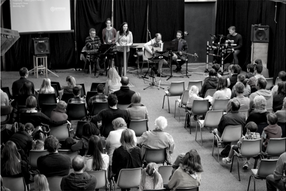 We'd love for you to join us on Sunday mornings for our weekly service! You'll find a map to our location just below.